The 49 year-old said he made the decision for family reasons. 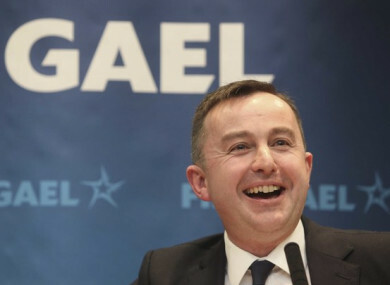 FINE GAEL MEP Brian Hayes has announced he will leave politics next year. The 49 year-old is set to become the CEO of the Banking and Payments Federation Ireland after the current European Parliament term ends next May. Announcing the news on Today With Sean O’Rourke on RTÉ Radio 1 this morning, Hayes revealed that he had made the decision for family reasons. “I suppose someone said ‘never say never’, it’s a bad thing to do,” he said. Hayes informed the Taoiseach of his decision yesterday, and said Leo Varadkar was “really supportive and kind” towards him. “I gave an interview to HotPress when I was 24 years of age and said I’d be out of politics by the age of 50, and he reminded me that was his ambition as well,” he said. Hayes was first appointed to the Seanad by former Taoiseach John Bruton in 1995, before becoming a TD for the Dublin South-West constituency in 1997. He lost his seat in 2002, but served the constituency again from 2007 to 2014, a stint that included a role as Minister for State at the Department of Finance from 2011 to 2014. Hayes said his most enjoyable time in politics was working under Minister for Finance Michael Noonan, adding that his biggest achievement was helping Ireland out of the financial crisis. In an official statement, he thanked Fine Gael party for its support during his political career, and said he had made many friends in politics. He added that he was looking forward to working with the BPFI team and the financial services industry as a whole to help re-position the sector as a driver for investment and growth in Ireland. Commenting on Hayes’ appointment to the BPFI, the group’s president Jonathon Lowey said he was “delighted” to confirm the news. “A natural leader, Brian has a track record of delivering on his commitments and overseeing the delivery of complex legislation and developing long-term relationships with key stakeholders, both at home and abroad,” he said. Email “Brian Hayes to quit politics to become CEO of Banking and Payments Federation Ireland”. Feedback on “Brian Hayes to quit politics to become CEO of Banking and Payments Federation Ireland”.